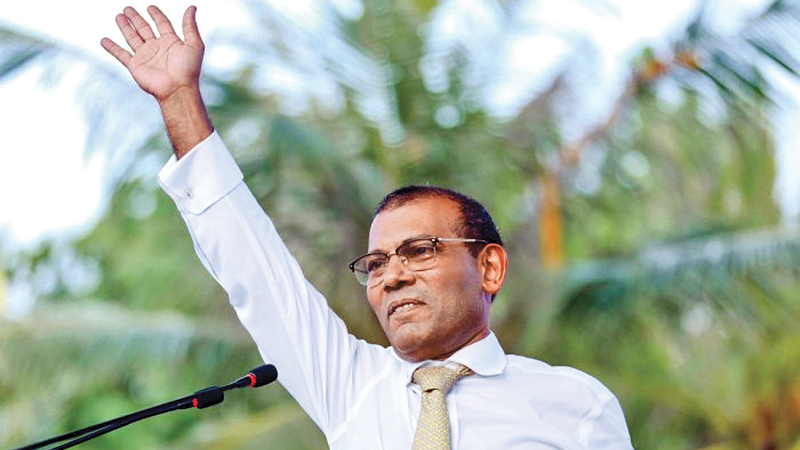 In this file photo taken on November 1, 2018 former president of the Maldives Mohamed Nasheed waves as he addresses the country after returning from exile to the Maldives. THE MALDIVES: The exiled former leader of the Maldives has led his party to a landslide victory only five months after returning to the country, preliminary results showed Sunday. “While we celebrate, we must also not forget the immense challenges that lie ahead of us,” he said. Solih campaigned for the MDP asking voters to return a parliament that could work with him to deliver on his election promises in September to investigate corruption under Yameen. While Yameen was not a candidate, his Progressive Party of Maldives was seen as the main challenger to the MDP -- but ended up with a poor showing, and is projected to get only four seats.